3. 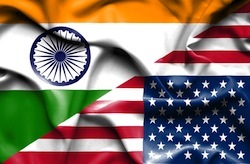 Schedule your interview with the U.S. Embassy in New Delhi, India. You may schedule your interview at any U.S. Embassy or Consulate, however, it may be difficult to qualify for a visa outside of your place of permanent residence. In general, you must schedule an appointment for your visa interview at the U.S. Embassy or Consulate in the country where you live. The approximate appointment wait time is 3 calendar days (as of November 5, 2015). All Blanket L Visas are processed at the U.S. Consulate General in Chennai. Skype: To use Skype to speak to a customer service representative Monday - Friday from 8:00 a.m. to 8:00 p.m., India Standard Time (IST), and Sunday from 9:00 a.m. to 6:00 p.m., IST, please add a new contact to your Skype account with the Skype name ustraveldocsindia.